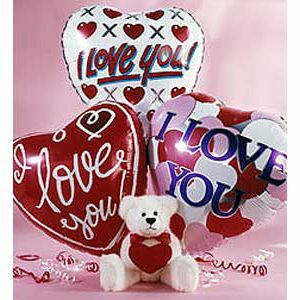 Say "I Love You" and "Happy Valentine's Day" with a medium sized soft bear & balloon bouquet to make their heart soar!, $32. Or attach a larger sized soft bear $42. Our designers will select three mylar (foil) balloons which reflect the text "I Love you", "Valentine's Day", other love sentiments and symbols, and add a soft and irresistible plush to send your love and hugs straight to their heart. Note: Plush bear and balloon designs may vary by availability. If you do not prefer "love" balloons, specify type of balloons requested.